Hello all. I hope you have not been wondering where I have been. In all honesty, I do not know what to tell you if you are requiring an answer. A lot of things have happened in the past month and a half since my absence from here began. I completed final exams, passed my astronomy class with a C, broke up with the guy I was dating, and finally got a job. Yes, I have a job now. I am a working woman. A week and a half ago, I walked into a meeting for the school newspaper and came out with a job. It is a scary thing, having a job thrust on you all the sudden, but I am hoping to bring great things to this paper along with the rest of the staff. In the meantime, I have taken on a massive project as a wedding gift. I cannot take a picture of it now, but once it is finished, there will be an awesome picture of it up on this blog. The only reason I do not want to share a picture with you all is because it is supposed to be a surprise for the couple. Other than that, I do not have much new stuff to share with you. 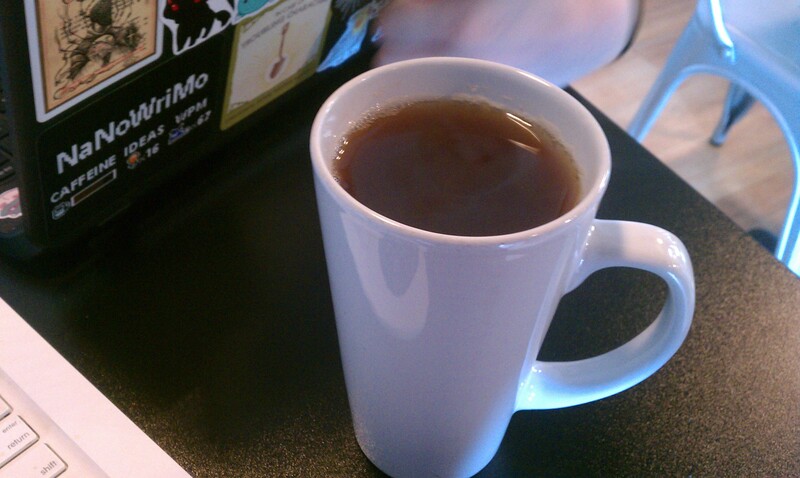 So here, have a picture of tea at my FAVORITE coffee place. Congrats on the new job! And can’t wait to see your project.